Auscultation of the lung remains an essential part of physical examination even though its limitations, particularly with regard to communicating subjective findings, are well recognised. The European Respiratory Society (ERS) Task Force on Respiratory Sounds was established to build a reference collection of audiovisual recordings of lung sounds that should aid in the standardisation of nomenclature. Five centres contributed recordings from paediatric and adult subjects. Based on pre-defined quality criteria, 20 of these recordings were selected to form the initial reference collection. All recordings were assessed by six observers and their agreement on classification, using currently recommended nomenclature, was noted for each case. Acoustical analysis was added as supplementary information. The audiovisual recordings and related data can be accessed online in the ERS e-learning resources. The Task Force also investigated the current nomenclature to describe lung sounds in 29 languages in 33 European countries. Recommendations for terminology in this report take into account the results from this survey. René Théophile Hyacinthe Laënnec first presented his invention of the stethoscope at the Necker Hospital (Paris, France) in September 1816 . Almost 200 years later, this instrument is “the old warrior of medicine … it clings tenaciously, resisting retirement” . While an array of more elaborate and expensive technologies for the diagnosis of chest diseases has emerged over time, auscultation of the lung still provides valuable, immediate and low-cost information to the experienced clinician. The value of lung auscultation is limited by the fleeting nature of breath-related sounds, the subjectivity of perception and the difficulty in using a standardised terminology to describe and document the auditory findings. With the advance of computer technology, objective acoustical analysis of respiratory sounds has become practical . In 2000, a Task Force of the European Respiratory Society (ERS) on Computerized Respiratory Sound Analysis presented a definition of terms . The focus of this terminology was on the computerised acquisition and processing of respiratory sounds. In the English-speaking world, Laënnec's original characterisation of adventitious lung sounds as “rales”, with qualifying descriptors relating to their “wet” and “dry” character , has been superseded by the terms of “crackles” (for brief, snapping, “discontinuous” sounds) and “wheezes” (for longer, musical, “continuous” sounds) . In 1977, an ad hoc committee of the American Thoracic Society and the American College of Chest Physicians on pulmonary nomenclature suggested the use of “crackle”, subclassified as “fine” or “coarse” depending on their perceived high or low pitch, “wheeze” for a high-pitched whistling or hissing sound, and “rhonchus” for a low-pitched continuous snoring-type sound . At a symposium of the International Lung Sounds Association in 1985, this nomenclature was presented also in corresponding French, German, Japanese, Portuguese and Spanish terms . Most recently, these terms were included in a summary of normal and adventitious lung sounds that also included “bronchial breathing”, “stridor”, “pleural friction rub” and “squawk” . The adoption of this terminology has been slow and not uniform. Significant variation still exists among healthcare professionals [10, 11] and in medical publications [12, 13]. Patients and caregivers may have a different understanding of these terms and use other descriptions altogether [14, 15]. This has significant implications on their communication with healthcare professionals and on the estimation of asthma prevalence . Presenting audiovisual recordings of respiratory sounds to parents of young children with reported wheeze can help them to clarify the nature of the observed symptoms . Video questionnaires have successfully overcome part of the language-related difficulties in population studies of asthma . The initial move to form the present Task Force on Respiratory Sounds within the ERS therefore came from paediatric pulmonary clinicians who proposed to establish a reference collection of audiovisual recordings of respiratory sounds, appreciating the influence of respiratory sounds on disease classification in young children . The objectives for this project were: 1) to establish a database of highest quality audiovisual recordings of respiratory sounds as a reference to standardise nomenclature; 2) to provide objective characterisation of all recordings, using established acoustic parameters; and 3) to offer descriptions of all recordings based on consensus by an expert panel. The envisioned purposes of this ERS reference collection of respiratory sounds were to unify nomenclature at national and international levels, serve as a resource in the education and examination of healthcare professionals, and educate lay audiences about the assessment of respiratory health. The collection of information on lung sound nomenclature in the countries of Europe then became an additional objective. At the initial meetings of Task Force members, five centres with interest in acquiring audiovisual recordings of respiratory sounds were identified: Athens, Greece (K.N. Priftis, Paediatrics), Murcia, Spain (L. Garcia-Marcos, Paediatrics), Winnipeg, MB, Canada (H. Pasterkamp, Paediatrics), Zwolle, the Netherlands (P.L.P. Brand, Paediatrics) and Tromsø, Norway (H. Melbye, General Medicine). Each centre obtained ethics approval at their institution and prepared consent forms in their required formats. An instructional video was recorded to demonstrate the preparation of a standardised setup for data acquisition. Briefly, the tubing of a professional grade stethoscope was cut off at a length of 10 cm from the head piece to allow the insertion of a small microphone. This modified stethoscope assembly was then connected to a video camera with external microphone input and capability for high-definition video recording. Sounds were monitored via headphones during recording (figure 1). A similar setup had previously been useful to record an instructional video for parents of young children . Schematic of recording setup. 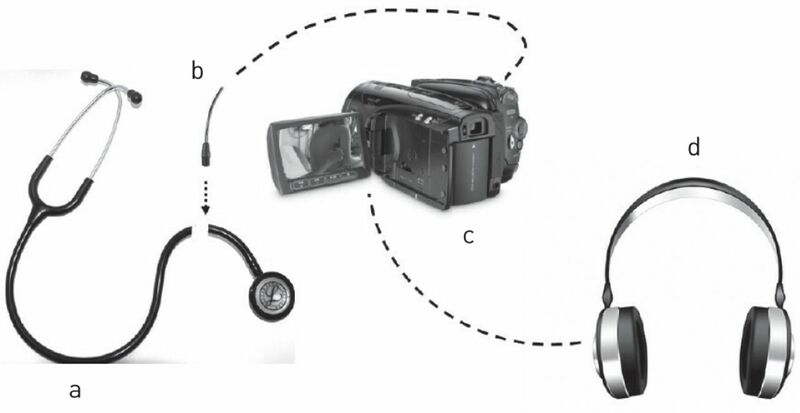 a) Stethoscope, b) insertion of microphone, c) video camera, d) headphones for monitoring. The protocol asked for the acquisition of ideally 1 min of continuous audiovisual recording in a quiet location with proper lighting. Audiovisual files were anonymised by avoiding the inclusion of facial features in the frame when recording at the anterior chest. File names followed a numbering scheme and naming convention that only identified the centre where the recording was acquired. Quality assurance required that ≥15 s of continuous recording could be extracted from the audiovisual file, that there was minimal artefact, that the respiratory phases were visible and that a sound of interest could be demonstrated. To be included in the reference collection, approval by at least three of the four centres that were not involved in the recording was required (see supplementary data for the online questionnaire to collect evaluations). The respiratory sounds of files selected for the reference collection were described by six expert members of the Task Force (H. Pasterkamp, H. Melbye, K.N. Priftis, L. Garcia-Marcos, M. Everard and P.L.P. Brand). The online questionnaire for quality assurance was minimally changed to collect their subjective impressions (see supplementary data). Objective acoustical analysis of the selected files was performed for the online presentation of the reference collection at the ERS e-learning pages (see supplementary data for technical details). The audiovisual recordings of the reference collection were formatted for streaming online at dedicated ERS e-learning pages (figure 2). Their presentation includes information on expert opinion and observer agreement. The description of objective computerised analysis and respective graphs can be accessed by opening related pages (figure 3). These pages also offer an option to download an open access programme for computer analysis and a version of the recordings that is compatible with this software. Example of case presentation. Reproduced from . Example of acoustical analysis (sonogram). Reproduced from . Collaborators in the survey of lung sound nomenclature in European countries had either volunteered at ERS Assembly meetings to participate in this project or were identified from the ERS directory as national representatives. In the recruitment of collaborators we took into account publications or otherwise documented interest in this area. We aimed to achieve national representation in both paediatric and adult respiratory medicine and a larger number of participants from the most populous countries. The goal was to obtain two replies from each country in this first attempt at gathering the information. Invitations were sent by email with a link to an online questionnaire. The English nomenclature in that questionnaire was based on the recent review in the New England Journal of Medicine . From a total of 72 recordings acquired to date, 20 met the quality assurance criteria and were accepted by at least three out of four evaluators. Most of the rejected recordings had been obtained from children and contained movement-related noises that did not allow the extraction of ≥15 s without significant artefacts. Table 1 summarises this selection of 10 recordings of paediatric and 10 of adult cases. There were nine female and 11 male patients. Agreement between six expert observers was weakest for three paediatric cases of lower respiratory tract infection with low-pitched wheezes/rhonchi. The fourth case with weak agreement had a pleural rub that was not recognised as such by three out of six observers. Our observations on observer agreement have been presented . The reference collection is now accessible online at the ERS e-learning pages, with streaming of audio and video . The material can be rated and comments can be added and reviewed. The invitation to complete a questionnaire on lung sound nomenclature in European countries was sent in November 2014, with three iterations to improve the response rate. A total of 66 completed surveys (64 from countries other than the UK) were received from 99 invitees. These represented 33 countries and 29 languages (see supplementary data). The term “normal lung sounds” was used in 24 out of 29 languages, while the term “vesicular sounds” was used in 19 out of 29. “Murmur” was mentioned in six out of 29 languages to describe normal (basic) sounds. “Crepitations” to describe crackles was reported in 16 out of 29 languages. “Rhonchus” was used in the same or very similar form in 15 out of 29 languages, while four out of 29 used “rales” and two out of 29 used “crackles”. One report from France mentioned the interchangeable use of “rale” and “rhonchus”. Only 15 out of 29 responses mentioned a term corresponding to “squawk” (details of all responses can be viewed in the supplementary data). Table 2 summarises current lung sound nomenclature in the six most widely spoken European languages, using the format of the 1987 presentation of nomenclature on adventitious lung sounds in different languages . Russian as a European language replaces Japanese in this table. “Respiratory sounds” was introduced as a Medical Subject Heading in 1980 and defined as “noises, normal and abnormal, heard on auscultation over any part of the respiratory tract”. 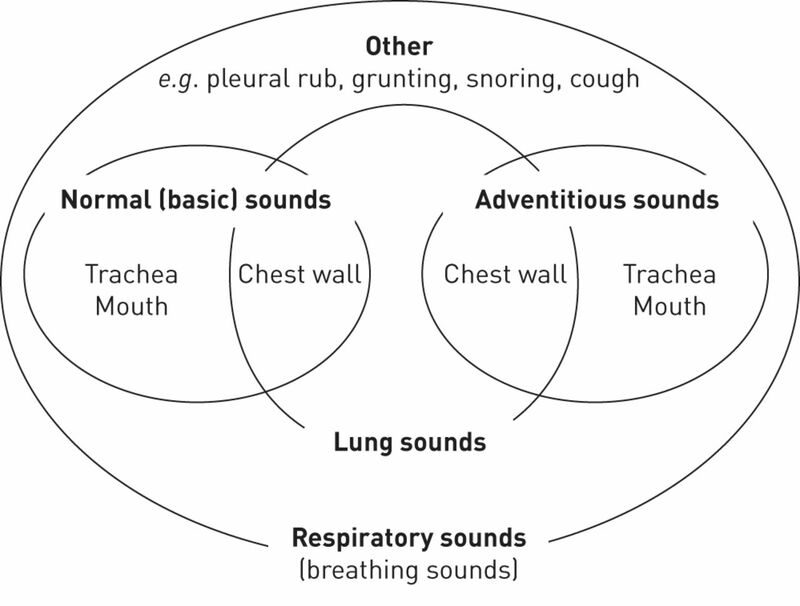 The ERS Task Force on Computerized Respiratory Sound Analysis presented a schematic of the relationship between the terms respiratory sounds, breath sounds and lung sounds . We suggest a modification, using “normal (basic) sounds” instead of “breath sounds”, because “breathing sounds” is a recognised entry term for “respiratory sounds” in PubMed (figure 4). Suggested classification of sounds. Reproduced and modified from  with permission from the publisher. The current nomenclature on lung sounds in European countries shows similarities that nevertheless do not conform to the recommended terminology in the English language . Respiratory sounds heard normally on the chest of healthy subjects, i.e. normal or basic lung sounds, are still characterised as “vesicular” in many languages. While Laënnec considered normal lung sounds to originate from the flow of air in and out of alveoli, later investigations of the origin of respiratory sounds have not shown lung “vesicles” to participate in sound generation . The term “vesicular lung sounds” should therefore be replaced by “normal” or “basic” lung sounds. The term “crepitations” to describe crackling sounds is widely used across the European languages. Both “crepitations” and “crackles” refer to brief, non-musical, “discontinuous” sounds. Potential confusion may arise when the qualifier “coarse” is added, since “crepitations”, at least in the English language, more typically refers to fine crackles, e.g. bone crepitus in fractures. The interchangeable use of “fine crackles” and “crepitations” may be considered, but “coarse crackles” should be kept, considering that there are different mechanisms of sound origin, i.e. sudden opening of airways in restrictive lung diseases implicated in “fine crackles” (e.g. “Velcro”-like crackles as an early sign of pulmonary fibrosis ) versus secretion-related sounds and rupture of fluid menisci in “coarse crackles” . “Rhonchus” appears to be a most difficult term. Nevertheless, it is widely used across European languages, perhaps because in the past both “rales” and “rhonchi” have been used to describe, with qualifiers, any adventitious lung sound. The recommendation to apply it only to low-pitched “continuous” sounds  does not take into account differences in sound waveforms, i.e. the pure sinusoidal wave of a low-pitched wheeze versus complex repetitive waves of similar tonal pitch but rougher, snoring character. The generation of these two types of low-pitched musical or quasi-musical sounds can be quite different, e.g. airway wall flutter versus movement of air through secretions with successive rupture of fluid menisci . Not surprisingly, most of the lung sound recordings with poor observer agreement in our collection were in this category. Since a low-pitched wheeze may signify different pathology from a snore-like sound, “rhonchus” should probably be placed in its own category, i.e. somewhere between a musical and non-musical sound. A “squawk”, i.e. a brief, almost exclusively inspiratory wheeze, was first described in relation to extrinsic allergic alveolitis and other pulmonary fibroses . Since then it has also been observed in patients with pneumonia . Laënnec appreciated wheeze (“râle sibilant”) of widely different character: “sometimes it resembles a little prolonged whistle, low or high, or it is rather dull sound, but at other times this noise is quite short and sounds like the cry of small birds” . Recognising that short inspiratory wheezes may signify pathology different from the longer, predominantly expiratory wheezes in asthma may justify the use of a separate term. However, the lack of a corresponding term in most of the European languages highlights a need for further education in this regard. The reference collection in its current scope invites further expansion, particularly with regard to sounds of contentious classification, e.g. rhonchi and low-pitched wheezes, also normal respiratory sounds at different ages, and sounds of extrathoracic origin, e.g. stridor and grunting. Several centres that participated in the initial recordings have committed to continue data acquisition. Directions and guidance with regard to further recordings and their presentation will also be based on commentaries and suggestions that users can leave at the e-learning pages. Linguistic considerations when interpreting international questionnaires may be especially relevant with regard to estimating the prevalence of asthma . As envisioned, the ERS reference collection should be of value to standardising lung sound nomenclature internationally and also at national levels. Our survey on current terminology provides a starting point, and past efforts in the Netherlands  and in France  may offer some guidance to national working groups. 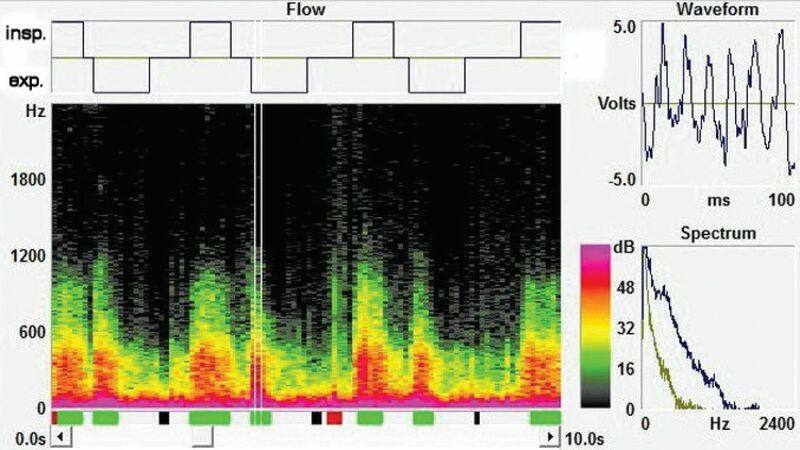 Expectations that computerised lung sound analysis would influence terminology in clinical practice based on objective characterisation have been high . To validate and expand the acoustical analyses of the recordings in the ERS reference collection, researchers in acoustics and computer engineering may be given access. A consensus on the objective characteristics of respiratory sounds, particularly those where observer agreement is poor, could then help in determining appropriate terminology. As the reference collection grows, future uses may include the assessment of skills and examination of students and practitioners in the healthcare professions. Furthermore, the materials may be prepared for presentation to lay audiences to improve their understanding and reporting of respiratory symptoms. Finally, audiovisual recordings could be presented in the context of corresponding structural and functional imaging studies, leading to a better appreciation of the strengths and limitations of lung auscultation. We are thankful for encouragement by Peter M.A. Calverley to form the Task Force and pursue this project. The expert advice and support by Pascal Kurosinski, European Respiratory Society e-learning Senior Coordinator, is greatly appreciated. The following collaborators provided information on current lung sound terminology in European countries. H. Hafisi: Third Pulmonology Service, Faculty of Medicine, Tirana, Albania; H. Olschewski: Universitätsklinik für Innere Medizin, Medizinische Universität Graz, Austria; K. DeBoeck: Pediatric Pulmonology, Dept of Pediatrics, University Hospital Gasthuisberg, Leuven, Belgium; G. Leemans: Dept of Pulmonary Medicine, Antwerp University Hospital, Antwerp, Belgium; G. Liistro: Université catholique de Louvain, Institut de Recherche Expérimentale et Clinique, Pôle Pneumologie, Brussels, Belgium; G. Postiaux: Grand Hôpital de Charleroi, services des soins intensifs et de pédiatrie, Charleroi, Belgium; D.S. Petrova: Dept of Propaedeutic of Internal Diseases – Pulmonology, UMHAT “Alexandrovska” Medical University, Sofia, Bulgaria; G. Petrova: Pediatric Clinic, University Hospital “Alexandrovska”, Sofia, Bulgaria; M. Jakopovic: Dept for Respiratory Diseases Jordanovac, School of Medicine, University of Zagreb, University Hospital Center Zagreb, Zagreb, Croatia; S. Banac: Dept of Pediatrics, Clinical Hospital Center Rijeka, Rijeka, Croatia; T. Adamide: Dept of Respiratory Medicine, Nicosia General Hospital, Nicosia, Cyprus; P. Yiallouros: Cyprus International Institute for Environmental and Public Health in Association with Harvard School of Public Health, Cyprus University of Technology, Limassol, Cyprus; F. Salajka: Dept of Pneumology, University Hospital, Hradec Kralove, Czech Republic; P. Pohunek: Pediatric Pulmonology, Pediatric Dept, Charles University in Prague, 2nd Faculty of Medicine and University Hospital Motol, Prague, Czech Republic; A. Loekke: Dept of Pulmonary Medicine, Aarhus University Hospital, Aarhus, Denmark; M-A. Riikjarv: Tallinn Children's Hospital, Tallinn, Estonia; M. Korppi: Tampere Centre for Child Health Research, Tampere University and University Hospital, Tampere, Finland; E. Andres: Faculté de Médecine, Université de Strasbourg, Service de Médecine Interne, Clinique Médicale B, CHRU de Strasbourg, Strasbourg, France; B. Crestani: Université Paris Diderot, APHP, Hôpital Bichat, Service de Pneumologie A, DHU FIRE, Paris, France; M. Fayon: CHU de Bordeaux, Hôpital Pellegrin-Enfants, Pneumologie Pédiatrique, Centre d'Investigation Clinique, Bordeaux, France; S. Blanchon: Unité de Pneumo-allergologie pédiatrique, Hôpital des Enfants, Toulouse, France; K. Bushljetikj: Clinical Hospital Adibadem Sistina, Skopje, FYROM; E. Vlashkie: University Children's Clinic, Skopje, FYROM; C. Lange: Clinical Infectious Diseases and German Center of Infection Research, Research Center Borstel, Borstel, and International Health/Infectious Disease, University of Lübeck, Lübeck, Germany; M. Gappa: Children's Hospital, Marienhospital Wesel, Wesel, Germany; M. Anthracopoulos: Dept of Paediatrics, School of Medicine, University of Patras, Patras, Greece; P. Bakakos: First University Dept of Respiratory Medicine, Sotiria Chest Diseases Hospital, University of Athens, Athens, Greece; I. Horvath: National Koranyi Institute for Pulmonology, Budapest, Hungary; A. Bánfi: “Svábhegy” Health Service Ltd for Allergy, Immunology and Pulmonary Diseases, Budapest, Hungary; D.W. Cox: Respiratory Dept, Our Lady's Children's Hospital, Crumlin, Dublin, Ireland; S. Aliberti: Dept of Health Science, University of Milan Bicocca, Clinica Pneumologica, Monza, Italy; A. Foresi: Lung Function and Sleep Unit, Sesto San Giovanni Hospital, AO Istituti Clinici di Perfezionamento, Milan, Italy; D. Peroni: Dept of Medical Sciences, Section of Paediatrics, University of Ferrara, Ferrara, Italy; F. Midulla: Dept of Pediatrics, “Sapienza” University of Rome, Rome, Italy; R. Snipe: Children University Hospital, Riga, Latvia; D. Gardovska: Paediatric Dept, Children's University Hospital, Riga, Latvia; A. Valiulis: Clinic of Children's Diseases, Medical Faculty, Vilnius University, Vilnius, Lithuania; P. Merkus: Dept of Pediatrics, Division of Respiratory Medicine and Allergology, Amalia Children's Hospital, Radboud University Medical Centre, Nijmegen, The Netherlands; L.N.A. Willems: Dept of Pulmonology, Leiden University Medical Center, Leiden, The Netherlands; E. Carlsen: Pulmonary Dept, Bodø Hospital, Bodø, Norway; K-H. Carlsen: Dept of Paediatrics, Oslo University Hospital and University of Oslo, Oslo, Norway; J. Domagala-Kulawik: Dept of Pneumonology, Medical University of Warsaw, Warsaw, Poland; A. Bugalho: Hospital Cuf Infante Santo and Chronic Diseases Research Center (CEDOC), Faculdade de Ciências Médicas, Universidade Nova de Lisboa, Lisbon, Portugal; I. Azevedo: Paediatric Dept, Faculty of Medicine, EPIUnit – Institute of Public Health, University of Porto, Porto, Portugal; D. Ionita: Elias University Hospital, Bucharest, Romania; M. Craiu: Carol Davila Medical University, Alfred Rusescu Children's Hospital, Bucharest, Romania; R. Fassakhov: Kazan Research Institute of Epidemiology and Microbiology, Ministry of Health, Tatarstan, Russia; E. Kondratyeva: Russian Cystic Fibrosis Centre, Cystic Fibrosis Dept of the Medical Genetic Scientific Cente, Moscow, Russia; M. Vukcevic: Dept of Pulmonology, CHC Zemun, Medical School of Belgrade, Belgrade, Serbia; P. Minic: Dept of Pulmonology, Mother and Child Health Institute of Serbia, School of Medicine, University of Belgrade, Belgrade, Serbia; M. Brezina: Pediatric Pneumology Clinic, University Hospital Bratislava, Bratislava, Slovakia; A. Rozman: Dept of Interventional Pulmonology, University Clinic Golnik, Golnik, Slovenia; U. Krivec: Unit for Pulmonary Diseases, University Children's Hospital, University Medical Centre, Ljubljana, Slovenia; J. Ancochea: Servicio de Neumología, Instituto de Investigación Sanitaria Hospital Universitario de la Princesa, Universidad Autónoma de Madrid, Madrid, Spain; C. Picado: Dept of Pneumology and Respiratory Allergy, Hospital Clinic, IDIBAPS, Universitat de Barcelona, Barcelona, Spain; M. Sánchez-Solís: Pediatric Service, Virgen de la Arrixaca University Hospital, University of Murcia, Murcia, Spain; A. Martinez-Gimeno: Dept of Pediatrics, Complejo Hospitalario de Toledo, Toledo, Spain; G. Hedlin: Dept of Women's and Children's Health, Centre for Allergy Research, Karolinska Institutet, Karolinska Universtity Hospital, Stockholm, Sweden; G. Wennergren: Dept of Paediatrics, University of Gothenburg, Queen Silvia Children's Hospital, Gothenburg, Sweden; J. Barben: Division of Paediatric Pulmonology and Allergology, Children's Hospital of Eastern Switzerland, St Gallen, Switzerland; D. Stolz: FMH Internal Medicine and Pneumology, University Hospital Basel, Clinic of Respiratory Medicine and Pulmonary Cell Research, Basel, Switzerland; F. Yildiz: Pulmonary Diseases Dept, School of Medicine, Kocaeli University, Umuttepe Campus, Kocaeli, Turkey; B. Karadag: Division of Paediatric Pulmonology, Faculty of Medicine, Marmara University, Istanbul, Turkey; R.I. Ketchell: Dept of Cystic Fibrosis, University Hospital Llandough, Cardiff, UK; I. Doull: Dept of Paediatric Respiratory Medicine and Paediatric Cystic Fibrosis Centre, Children's Hospital for Wales, Cardiff, UK; O. Mazulov: Dept of Pediatrics No. 1, Vinnitsa State Medical University, Vinnitsa, Ukraine; T. Pertseva: Dnepropetrovsk State Medical Academy, Dnepropetrovsk, Ukraine. Endorsed by the European Respiratory Society Executive Committee on September 30, 2015. Support statement: This study received funding from the European Respiratory Society (TF-2011-04). Funding information for this article has been deposited with FundRef.
. Reception of the stethoscope and Laënnec's book. Thorax 1981; 36: 487–492.
. The medical influence of the stethoscope. Sci Am 1979; 240: 148–150.
. Respiratory sounds. Advances beyond the stethoscope. Am J Respir Crit Care Med 1997; 156: 974–987. Definition of terms for applications of respiratory sounds. Eur Respir Rev 2000; 10: 597–610.
. Rales, rhonchi, and Laënnec. Lancet 1957; 273: 417–423.
. Crackles and wheezes. Lancet 1967; 2: 203–205. ATS-ACCP Ad Hoc Subcommittee. Report on pulmonary nomenclature. ATS News 1977; 3: 5–6. International Symposium on Lung Sounds. Synopsis of proceedings. Chest 1987; 92: 342–345.
. Fundamentals of lung auscultation. N Engl J Med 2014; 370: 744–751.
. Nomenclature used by health care professionals to describe breath sounds in asthma. Chest 1987; 92: 346–352. Variation in family physicians’ recording of auscultation abnormalities in patients with acute cough is not explained by case mix. A study from 12 European networks. Eur J Gen Pract 2013; 19: 77–84.
. Lung sound terminology in case reports. Chest 1979; 76: 690–692. Murphy RL Jr., et al. Lung sound nomenclature survey. Chest 1990; 98: 886–889. Survey of respiratory sounds in infants. Arch Dis Child 2001; 84: 35–39.
. Parents’ interpretations of children's respiratory symptoms on video. Arch Dis Child 2001; 84: 31–34. Parental understanding of wheeze and its impact on asthma prevalence estimates. Eur Respir J 2006; 28: 1124–1130. A video questionnaire identifies upper airway abnormalities in preschool children with reported wheeze. Arch Dis Child 2005; 90: 961–964. Worldwide variations in the prevalence of asthma symptoms: the International Study of Asthma and Allergies in Childhood (ISAAC). Eur Respir J 1998; 12: 315–335. Definition, assessment and treatment of wheezing disorders in preschool children: an evidence-based approach. Eur Respir J 2008; 32: 1096–1110. “Breath by breath” – an educational video for caregivers to recognize respiratory distress in young children. Presented at the 26th International Lung Sounds Conference, Berlin, 2001. Abstract available at: www.ilsaus.com/pdf/26th_ILSA_2001.pdf Date last accessed: November 18, 2015. European Respiratory Society e-learning resources. Reference Database of Respiratory Sounds – Wheezes. www.ers-education.org/sounds Date last accessed: November 18, 2015. Date last updated: September 3, 2014. Wheezes, crackles, rhonchi: agreement among members of the ERS task force on lung sounds. Eur Respir J 2014; 44: Suppl. 58, P4004.
. Lung sound nomenclature. Am Rev Respir Dis 1987; 136: 1016. Acoustic properties of the normal chest. Eur Respir J 1995; 8: 1761–1769.
. Crackles: recording, analysis and clinical significance. Eur Respir J 1995; 8: 2139–2148.
. Wheezes. Eur Respir J 1995; 8: 1942–1948. The inspiratory “squawk” in extrinsic allergic alveolitis and other pulmonary fibroses. Thorax 1982; 37: 923–926. Squawks in pneumonia. Thorax 2004; 59: 177–178.
. De l'auscultation médiate [On Mediate Auscultation]. 2nd Edn. Paris, Brosson and Chaude, 1819.
. Lineages of language and the diagnosis of asthma. J R Soc Med 2007; 100: 19–24.
. Rapport van de Commissie Nomenclatuur Longgeluiden [Report by the Commission Nomenclature Lung Sounds]. Ned Tijdschr Geneeskd 1991; 135: 2380–2383. A French national research project to the creation of an auscultation's school: the ASAP project. Eur J Intern Med 2009; 20: 323–327.
. Nomenclature stethacoustique pulmonaire: pourquoi pas un consensus mondial? [Pulmonary stethacoustic nomenclature: why not a worldwide consensus?] Rev Mal Respir 1999; 16: 1075–1090.